I did take a camera to the retreat on Mackinac Island but I didn't take any photos which was incredibly stupid of me. Luckily, someone did so if you want to see photos of just how beautiful the Grand Hotel is, check out TKGA's facebook page. The retreat was absolutely wonderful. My class went very well. I had a ton of fun teaching it and I hope my students had a good time as well. It looks like the retreat will become an annual event. Charles Gandy was there with his new book, The Embellished Sock. The book is beautiful. Not only are the socks fun, the typography and photographs are exquisite but I would expect no less from Charles. The photo shoot for the Fall issue of Cast On was on the 16th. Again, I forgot to take photos. The shoot was in Newark, OH, at and around The Works, a lovely little museum. They had a special exhibit of felted art which we used in some of the shots. I came home to lots of lessons. There was wireless at the Grand Hotel so my new students didn't have to wait for the materials. I've decided to stop sending a hard copy of the first lesson to new students unless they request it. This should make my mailman happy! I am really enjoying the Swatch to Sweater class. I love seeing the students ideas for designs. I have three students now at various stages of the process. I've let the students know that I am willing to help them size their garment if they want to try and get it published. After it took pretty much all day to upload the video from two weeks ago, I am going to try and keep the videos under five minutes. For that reason the tip this week is about right slanting M1 increases (or M1R). Next week I will do the left slanting. M1 increases, like all increases, should be mirrored. That means that there should be the same number of stitches before the increase at the right selvedge and after the increase at the left selvedge and that they are mirror images of each other (slant in opposite directions). 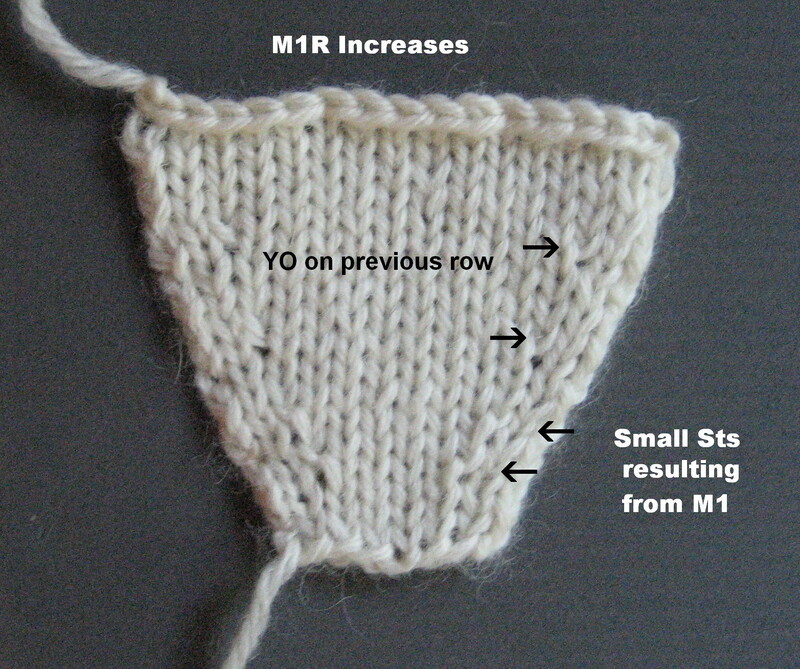 To make an M1 increase, you use the horizontal strand between two stitches. They can be open or slant to the left or right. The open form looks like a yarnover and should only be used in a decorative way. To make a slanted M1, the horizontal strand is twisted. Reading the instructions for making slanted M1 increases can be a bit cryptic. The instructions make much more sense when you see one made. I checked out a few of my references and they all give different ways to make them. Basically you lift the horizontal strand onto the needle and twist it. If the leg on top slants to the right, you have a right slanting one. Take my advise and watch the video:M1R. How you make it (whether you use your left or right needle to left the horizontal strand) doesn't really matter. It is the results. I am more concerned with how the increases look. A major problem with this increase is that since the horizontal strand between the stitches on the previous row is used, this pulls the yarn from those stitches. Since the stitch on the left is still on the needle when the increase is made, it stays about the same size. The stitch to the right gets very small which causes a tension issue. How big a deal is this? Well, if you are working this increase for the Masters Program, it is a concern. If you are using this increase at the seam line of a sleeve, it isn't that big of a deal unless you expect people to lift your arm up and inspect the seam. If you are working a sweater from the top down and you are using this increase along the neckline you should be aware of this problem. When you pick up stitches for the neckband, you will have a column of stitches next to it that vary in size from row to row....not very attractive. The easiest fix for this problem requires some thinking ahead. When you are working the row BEFORE the increase row, work a yarnover at the location where you would be pulling up the horizontal strand. On the increase row, use the yarnover for the M1. You'll have to reseat it to make the increase but the stitch to the right stays the same size. In the photograph above you can see the difference this makes. On the first example, you can see the smaller stitches. Yes, the hole at the base of the increase is smaller but the stitches to the right look strangled. In the examples at the top, the hole is more noticeable but the stitches are more uniform in size. If the holes bother you, use lifted increases instead. When properly worked, they are more invisible. Next week...left slanting M1 increases (M1L). Salon will be on Sunday this week. I plan on attending the Kentucky Sheep and Fiber Festival on Saturday. All sorts of vendors will be there and although I need more yarn like I need a hole in my head, I am sure I will be tempted. Miss Babs and her lovely yarn will be there. Babs and her able assistant Jen are staying at my house but, alas, their yarn is at the site for the festival. That is probably a good thing. The festival is only a few years old but it seems to grow every year. Last weekend was not a pretty sight here. I had intended to finish the Vlads pullover during my down time at the retreat. I didn't factor in how tired I would be after teaching all day. I doubt I knit 10 rows on the sleeves. That meant I really had to work hard to finish it before the photo shoot. I have never missed a deadline and I am happy to report I did finish it in time. Also, we are starting a new series, Finishing with Confidence, and I had to write the inaugural article. The plan is to have these articles on the TKGA.com website as well. I liked the Vlads pullover so much, I decided to keep it. I love this cable pattern. The cables are wrapped at the top which I haven't seen in many cable designs. 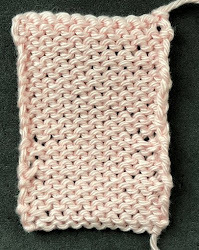 The featured stitch pattern in the August - October issue is cables. I have some time to work on my own projects. I decided to knit myself a pair of socks before beginning the next round of birthday socks. Since I wear so much black I decided to use some gray yarn named Luna Granite. I found a stitch pattern in one of the Japanese books I bought at Stitches West. It looks like cables but it is not. I plan on reversing the slant on the second sock. The deadline for submissions for the Winter issue of Cast On is June 1st. Instead of a stitch pattern, pleats will be the subject of the Stitch Anatomy lesson. I've been considering a couple of ideas already.